As of midnight on New Year's Eve, I only had one spoken-aloud resolution. "I want to take the time to sit and eat breakfast each morning before checking my email." It was a noble, if somewhat unambitious, goal. I've noticed that my heart races and I can't calm my mind at night if I've spent more than a little time before the glowing specter of my computer screen. It's just email. It can wait fifteen minutes for me to make tea and peel a banana. Day Two dawned and I slipped into my office and began working without a moment's hesitation to boil water for oatmeal. So, what's important? What am I aiming for this year? After all, there must be a goal, something to work toward and anticipate. I'd like to post more often here. My thesis work sometimes coincides with first drafts here, but not always. It would be good to take some of the pressure off of myself and write journal entries here, too. After all, daily life just isn't always interesting, inspiring, or memoir-worthy. Woke up late. Checked my email before breakfast. Resolution Fail. Got caught up with work while listening to Adele belt out Someone Like You on repeat for two straight hours. Her voice haunts me. I switched to Adele after trying the same thing with Maroon 5's Moves Like Jagger , and ended up dreaming about a stomping, gyrating Carson Kressley. The growling of my stomach startled the cat into jumping off my lap around 1:30. Almost forgot to eat lunch. Down to my last frozen bagel, really only a bagel in the literal sense. Round. Risen dough. Works as a vehicle for cream cheese. I'm dying for Noah's. Especially since the cream cheese is hardly worth chewing my way through a make-believe bagel. I cave and buy reduced-fat Philadelphia Cream Cheese every time I visit the store just because of the look Jonathan gives me when I grab the real thing. Like he knows so much better. Like we'll gain ten thousand pounds if I shop the way I want to. Like I don't know that. So, I buy the reduced-fat garbage and suffer through the oddly rubbered texture of it all for peace at home. And less poundage on my hips. Hips which, as Shakira warned me years ago, do not lie. Good news: The "fat jeans" are tucked away deep in a drawer of refusal and I will not take them out again. But I also refuse to make a resolution about weight loss. It's too prosaic. Too ordinary. And I'm too haughty to be ordinary when January 1 rolls around and expects to be picked up and snuggled and welcomed. As if it doesn't bring with it the promise, nay, the unavoidable truth of age. I wonder how many minutes I'll spend before my mirror in 2012, not asking it if I'm the fairest, because I'm not (and won't be so long as Ginnifer Goodwin is around), but rather preening my own scalp with a long, deft pair of tweezers and plucking those pesky grays. They pop up, literally, a different, wiry texture from the rest of my hair. Buoyant and vulgar; waving rudely. So, I pull 'em. Sick, right? The things a woman will do for the sake of vanity. I try to even out my shallowness by doing occasional exercise, too. Jogging, though not on the ice because it's slippery and I already know I don't bounce. Rock climbing, even though my mojo is currently missing. Today I did yoga, which is like a joke because I'm about as flexible as a No. 2 pencil. I can't even touch my own toes. But I'll spend half an hour pretending to bend into positions like those demonstrated by the slender, amiable, spandexed dame on TV. The one with the pert ponytail. The one who can twist herself into the @ symbol without breaking a sweat. Yes, my own yoga postures are akin to hers. Like distant cousins. Twice or thrice removed. Possibly inbred. A little slow on the uptake. Not so much Yoga as Yoga-esque. Yoga-ish. Yogurt, even. Something I don't eat here because it comes with granola and, for a texturephobe, the mere idea of granola pieces pebbling what should be the thick, smooth, vanilla curl of yogurt in your mouth is like looking at road rash. Disgusting? I agree. So, I steer clear of the yogurt and opt instead for fruit. Apples, pears, even the occasional banana. It's almost laughable, the sheer sense of vindication and validation one piece of cut-up fruit can give me at the end of the day. I may not have accomplished anything else, but hey, I dipped apple slices in peanut butter and kept the doctor at bay. I have a million things on my mind, most of which need to be done by Friday. And I know I'll get to them. That's part of what's nice about being me. I've known me long enough that I am confident in my ability to work hard, prioritize, accomplish tasks. And, if it comes down to it, I'm also confident in my ability to acknowledge the impossibility of doing a million things by Friday, and then taking steps to ease my own burden. I must be growing. Which is why I'm optimistic about the rest of the year. All evidence points to my achieving a lifelong goal this June, graduating with my master's degree in creative writing. 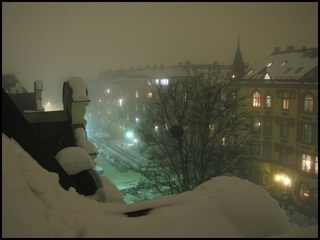 I already live abroad, something my husband and I dreamed about for years, and I'm adapting well to life in Oslo. I'm writing frequently, though not publishing yet, and while that's a source of some personal frustration, I know and appreciate how important it is to enjoy the act of writing itself in the meantime. It's all coming together. And when all else fails, I have you, dear Journal. Dear page that cannot talk back to me. Dear keyboard that feels like my own appendage, something with skin and a pulse. Yes, it's nice to know that you're always there. So, in 2012, dear Journal, I'm going to shoot for more time at the local climbing gym with Jonathan. Hopefully planning a climbing trip someplace exotic will give us the incentive to make the half hour tram ride out and back each week. And I'm going to continue submitting my writing with the hope that somebody somewhere thinks it's worth publishing. And I'm going to pour my energy into the friendships I've been establishing here in Oslo. By some twist of chance, I've landed in the midst of a lot of wonderful, interesting, loving people. A bunch of writers, too. It's the perfect environment in which to grow. Tomorrow I will walk with Jonathan, the soles of our shoes slipping aimlessly over the ice. As we fight to remain standing, we'll grab onto one another. Jacket lapels balled up between gloved fingers, flailing, worried that we'll wind up like Bambi on the frozen lake, just plain sprawled. But somehow we'll hold on and remain vertical, and this minor victory will make us laugh and give us the confidence to continue on. To buy cross-country skis. To fill ourselves with coffee and hot chocolate. The usual Norwegian stuff. On second thought, maybe my life is less mundane than I thought. So long as I can find profound life truths woven in with the hearty, heavy fabric of Nordic daily life, I can write on like a writer. I can make it all worthy of memoir.